Tank capacity 11 Litres - sufficient for approx 7 hours operation. 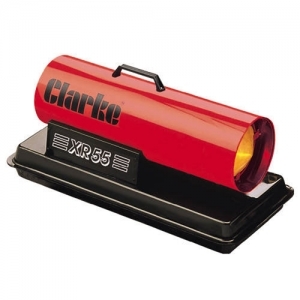 If you need to provide a large heat output this space heater from Clarke, the XR60 is ideal. This model has a maximum output of 50,000 btu equivalent to 14.7kw. You can use either diesel or paraffin as the fuel with a full tank allowing 7 hours continuous operation. Well built with a stainless steel combustion chamber, this space heater is designed to give thousands of hours trouble free use. Please note that these diesel/paraffin space heaters require adequate ventilation when in use.